Meta tags are specific snippets of text and image content that provide a summary for a webpage. 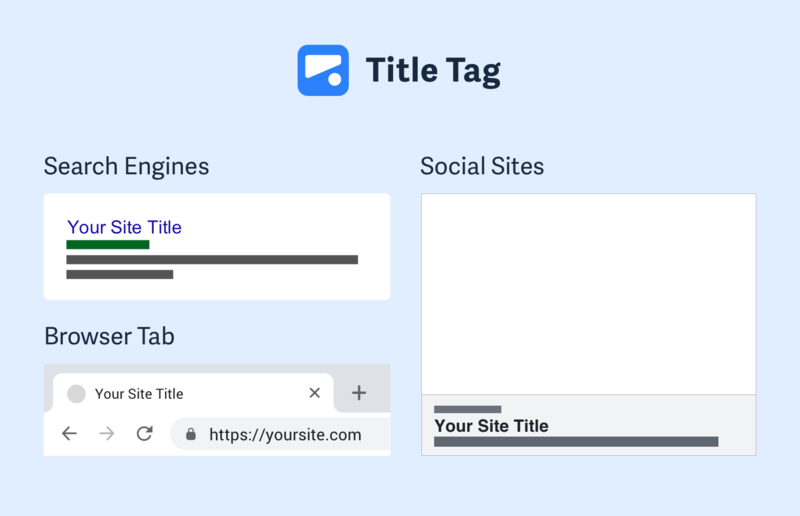 Often meta tag data shows up whenever someone shares a link on social media, in messaging, or in your business chat software 🙌. In addition meta tags can contain information to help search engines and other technical services scan your site to figure out what it’s all about and whether or not it’s legit! Wait, but why can’t I see meta data? Since the protocol was originally created for machines to examine, it is buried in code at the top of a website, which is exactly why this tool was created! Put any URL in the search box and our site helps you both visualize and edit the meta tag code so you can update it. How valuable sharing on social media and ranking in Google are for your site determines how significantly you should focus on your meta tags. Imagine walking into an abandoned store with shelves full of dust and a musty smell in the air 😕. A link to your site on Facebook or LinkedIn is often the very first interaction you have with a visitor and if it looks empty and unmaintained like a barren store, they’ll never even consider clicking the link. As part of most digital marketing campaigns, teams often create compelling copy and striking images, which conveniently lends itself perfectly to being a part of the meta data of your webpage. Double the value, half the work! This image is also the meta data image! Moreover generating meta data can be an important exercise in developing your concise sales pitch. Google only gives you 60 characters for your title and about 105 characters for your description—the perfect opportunity to tightly refine your value proposition. The SEO community is definitive on this topic, the most important meta tag for ranking is your title tag. No other meta tags affect SEO rankings but...that's not to say they're unimportant! Historically the "keyword" meta tag was a significant part of ranking, since early search engine robots used that value to categorize websites. But in 2009 Google made it official, the keyword meta tag is no longer a part of ranking and would potentially hurt your ranking if it is abused 😱. Instead modern SEO strategies focus on ranking highly in Google with high quality content and are supplemented with meta tag tweaks. Once you start ranking it's important that people actually click on your site which is where other parts of meta tag data plays an important role especially the meta image and meta description (read more below). A title tag is the second most important factor for on-page SEO, only trailing high quality content. In technical terms it is a very simple html code tag <title>Title</title> which you place at the very top of your webpage. But its simplicity is only hiding the fact that the 50-60 characters that Google gives you will affect your website traffic in several ways. Google Search - The main link that people click on. Social Sites - The title people see on FB, Linkedin, etc. Browser Tab - Subliminal marketing that persists in a tab. External Links - Commonly the text other sites use to link to your site. Consider the trifecta: Brand, marketing, and SEO. Keep the your title around 60 characters and put the keywords you’re focusing on first. Don't go overboard with keywords, at most stick to two. Backlinko does a fantastic job describing how to develop clickable titles in this monster guide to on page SEO. Meta descriptions while not useful for SEO reasons are incredibly valuable for engaging users who will click through to your site. The meta description often serves as a pitch to people who find your website on Google or social media sites. While it's not required and Google can use text from you website instead of what you specifiy in the meta data, it's better to control the description text where you can. Want to learn more? Moz is the authority in the SEO world and has an actionable guide to writing compelling descriptions. With the visual nature of the web your Meta Tag Image is the most valuable graphic content you can create to encourage users to click and visit your website. Most digital marketing and SEO websites ignore the value of graphic content since it requires design skills. But with free tools like Figma and Canva, anyone can create compelling imagery to add to their meta tags. On sites like Facebook, Twitter, and Linkedin, your meta image is 3x larger than your text content! As meta tag data can be overwhelming and your time is limited, you should focus on two things: title tag and meta image. The primary reason for building this tool is that it’s incredible difficult to focus on the main factors that matter for meta tags. Iterating on titles and images (and descriptions) is painful! 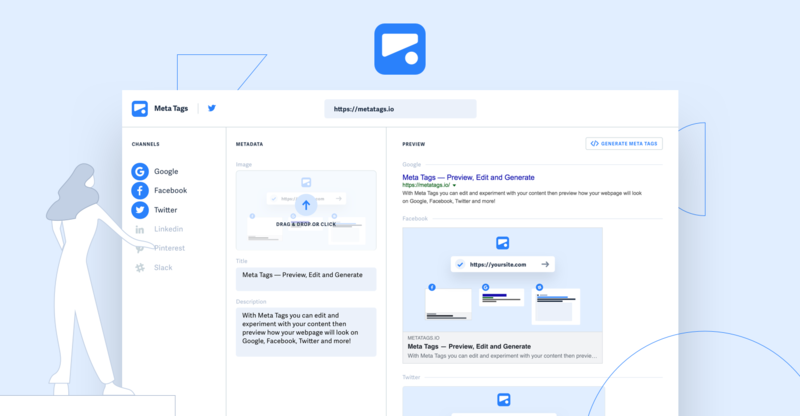 MetaTags.io was created to make this process enjoyable! Quickly testing different titles and images is a fluid, seamless workflow. Warning: Be sure to upload your image to your CMS or host. Meta Tags is a tool to debug and generate meta tag code for any website. This project is created by Moe Amaya a product designer based in San Francisco who builds resources for the design and development community.